China Defense Minister Liang Guanglie and Philippines Defense Secretary Voltaire Gazmin settle in for the closed-door meeting, in which they agree that unilateral action on disputed territories in the South China Sea would cause "alarm"
China’s defense minister has wrapped up meetings with Philippine officials this week pledging to resolve territorial disputes in the South China Sea through dialogue - not unilateral action. During Chinese Defense Minister Liang Guanglie’s visit with Philippines Defense Secretary Voltaire Gazmin, both sides emphasized maintaining peaceful relations, especially on territorial matters in the South China Sea. China, the Philippines and four other East Asian governments have claimed all or part of the resource-rich Spratly group of islands that are believed to hold large oil and natural gas deposits. Following a closed-door meeting in Manila Monday, Defense Department Spokesman Eduardo Batac read a joint statement from the two generals. “Both ministers acknowledge the need to ensure that the South China Sea remains stable and recognize the usefulness of the declaration on conduct of parties in the South China Sea,” he said. This non-binding code of conduct was signed in 2002 but its stipulations on using peace mean to resolve territorial disputes have not been implemented. The Association of Southeast Asian Nations (ASEAN) has been pressing China to agree to the proposal governing maritime actions in the region. The group of hundreds of reefs and small islands known as the Spratleys are claimed in whole or part by China, Vietnam, Malaysia, the Philippines, Brunei and Taiwan. Chinese and Philippine forces have occasionally faced-off in territorial disputes in the region. The pact is aimed at preventing those encounters from becoming larger conflicts. Philippine President Benigno Aquino had said earlier on national radio that he would raise the issue during the Chinese defense minister’s visit. But a presidential spokesman says the South China Sea was discussed only broadly. Officials released no details about whether they are now any closer to formalizing the agreement. 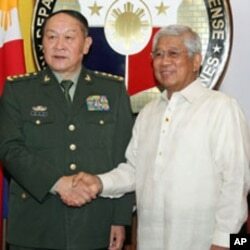 But Defense Department spokesman Batac said the generals took a clear stance favoring dialogue over conflict. “Both ministers recognize that unilateral actions that cause alarm should be avoided. It is also useful to continuously build confidence and cultivate trust between the respective ministries and their armed forces,” said Batac. In March, the Philippines filed an official protest with China following a standoff involving forces from both countries in the Reed Bank, just east of the Spratlys. Philippine officials say Chinese patrol boats threatened a survey ship that was mapping natural gas fields. A month later the country filed a formal complaint with the United Nations over a Chinese map that lays claim to a large part of the South China Sea.